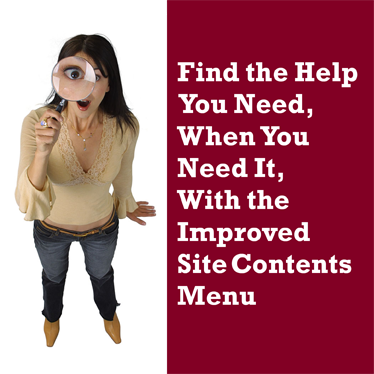 One of the challenges of a site with over 1000 articles is to make it as easy as possible for readers to find what they're looking for when they need it. To make that process easier, the site contents bar (on the left) has been revamped for better navigation. Within each section are links to pages with a sampling of the most helpful articles on that topic and a link to see all the articles on that topics. You'll also find the search bar and a complete label listing if you're looking for something more specific. Every writing article is labeled with the topic (or topics) it covers. Within each article you'll also find links to additional in-depth information on that topic, and we're working to make these links every more helpful moving forward. One of the long-term goals in 2014 is to cross-link every article on the site to make it as searchable and easy to use as possible. This section covers topics relating to planning a novel, from ideas, to process, to genres and word counts. It's all the details and pieces that typically comes first when planning a novel (and there's even advice for pantsers, who might not want to know all this before hand). The writing section delves deeper into craft-related topics, such as developing your voice, finding the right balance between dialog, action, and internalization, getting just the right POV and using various techniques to your advantage. This section focuses on the problems writers run into most frequently, with tips and advice on how to solve those problems. This section focuses on editing, revising, and reworking your novel, from the first look at the first draft to the final polish before it heads off to an agent or editor. This section covers the business side, from writing your query letter to finding an agent, or even how to create your own e-book and self publish instead. This section is all about being a writer and the struggles (and celebrations) we all go through in this sometimes challenging business. From inspiration and emotional support, to tips on how to be more productive with your writing time. These are the regular columns, with guest authors and contributing writers sharing advice and know-how, to readers with writing questions to be diagnosed on the site. If you're interested in submitting to one of these columns, you'll find all the information you need here. I feel smarter already. How much is it? I don't comment very often, but I do LOVE your blog and the new look is great. I get so much great information and inspiration. This post is just plain awesome. I will keep it handy. My God! This is the best site ever. Love the new look. I read the blog daily and have used the writing articles, sometimes referring to them multiple times. Thank you. Thank you. I love your blog and I'm sure I will love your new book as well! I LOVE the new look and seriously cannot wait to get my hands on your book! In the world of so much stuff out there on the internet, I found it necessary to seriously cut back on the number of writing blogs I follow. Yours was my #1 keep - and with all of these new changes and enhancements, it just might turn into my only :) Well done!! The new site is gorgeous and the search function finally works properly! Awesome! Wow, wow, wow! Look at this! Janice, it looks amazing. Thanks for organizing all your excellent advice. Site looks great and love the direction! Thanks for putting this all together like this. What a gift you give the writing world! Love the new title for your blog too. May it gain the recognition you deserve! You are truly amazing. I must ask again – do you sleep? Thanks for all you do for writers (and readers). Your help is always specific, detailed, and full of examples which help us understand how to do it better! I have some help, and that gives me time to sleep. (grin) Thanks! Bookmarked! Love your site and this is even better with the updates. Thanks! You have done it again Janice. I am even more of a loyal follower now. Keep up the good work. Big thanks to everyone! You guys make me feel all warm and fuzzy.